Did you put on sunscreen today? I hope you replied with an eye-rolling “Obvi,” because shame on you if you didn’t. Plot twist: The sun is an A-hole. Don’t let the whole ‘I am a star at the centre of the Solar System and provide life and energy to just about anything and everything’ image fool you. So, I am dedicating this post to sharing some of the most effective and ever-so easy ways of protecting your skin from the sun’s harmful effects, so you can spend more time actually enjoying its benefits (patio season included). 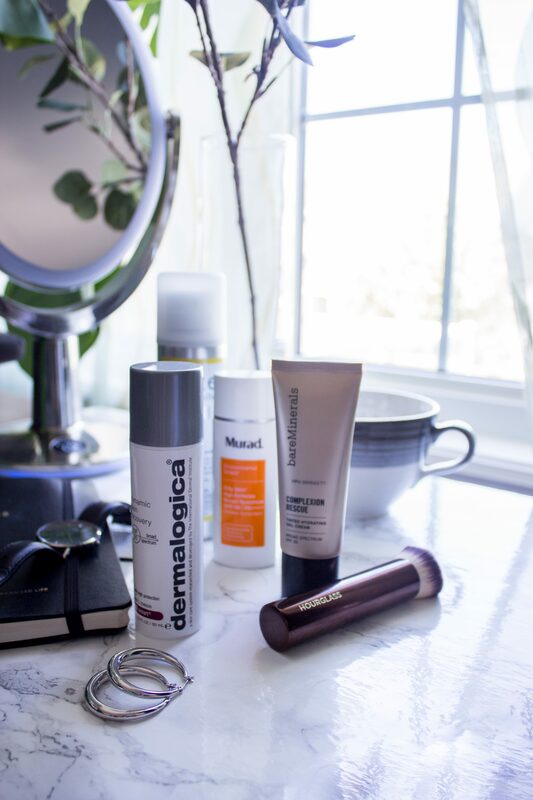 Scroll on, your skin will thank you. While the sun may provide us with Vitamin D, instant mood elevation, and artsy arm-over-face photos, unprotected exposure to its rays, UVA and UVB included, can have detrimental short- and long-term effects on our health and skin. UVB rays, with its focus on the skin’s surface and ability to directly damage the skin cell’s DNA, contribute to the burning of skin, eye damage, and, yes, skin cancers, while UVA rays penetrate deeper into our skin, prematurely aging it, adding wrinkles and age spots. Now, if only there was something to help minimize the risk of the damages above… Oh, wait. Investing in the right kind of product, applying (and reapplying) it correctly, and taking other necessary precautions (e.g. protective eye wear, yearly check-ups, etc.) can save your health and skin in the long run. Think more prevention, less treatment. Minimum SPF 30, but maximum SPF 50. The former, absorbing (or blocking, respectively) 96.7% of UVB rays, is considered ideal, while the later, absorbing 98%, is slightly better. While it may sound amazing to calculate that SPF70 will provide you with 700 minutes of sun protection (assuming that you burn after 10 minutes, of course), there is no actual scientific proof that anything above SPF50 is more effective and that calculation is only for theoretical (not practical or variable-dependant) purposes. Lastly, remember that no sunscreen can absorb 100% of UVB rays. Broad Spectrum protection. Knowing full well that both UVA and UVB rays are harmful, investing in a product that protects you only from the latter is beyond silly, as well as detrimental to your skin. Thus, look for the two-word indicator on the label to ensure well-rounded sun protection. Water-resistant. If the FDA isn’t fooled by the ‘water-proof’ and ‘sweat-proof’ claims, you shouldn’t be either. The term itself simply suggests the sunscreen’s ability to retain its SPF value during the time spent in water or sweating, as indicated on the label (e.g. 80 minutes). Lastly, while you won’t automatically turn into a red lobster after exactly 81 minutes, it is crucial to reapply sunscreen due to the decline in SPF protection thereafter. Apply generously. While creams are great in that you can see and feel the film upon initial application, sprays are to be used even more generously, as to supplement the ‘lost’ sunscreen that never meets the skin. Don’t forget about your ears, temples, hairline, back of your neck, etc. Absorption time is precious. It takes about 20-30 minutes for the sunscreen to be absorbed, so it’s best to exercise patience prior to exposing your skin to direct sunlight. Similarly, and if time permits, I prefer to apply makeup after the absorption period as well, as to guarantee the SPF penetration and avoid risking dilution with ingredients that of other products. Reapply every two hours and after swimming/sweating. I hope you had a “Duh!” moment right then and there, since SPF protection declines over time and gets broken down by water and sweat, making reapplication just as important as application in the first place. When in doubt, apply. Cloudy? Apply. Just running errands? Apply. I wish the younger me would know this, as to avoid multiple sunburns on overcast days and during car rides. Be on expiration date alert. While most sunscreens maintain their optimal performance for about 2-3 years, I tend to replace mine yearly, as certain storing environments (e.g. a heated glove compartment) are less than ideal and degrade the composition of the product. Don’t forget to shake well (the product, that is). Life doesn’t happen in a laboratory setting, with a perfect subject, in ideal conditions and with controlled variables. Instead, there are pre-dispositions (e.g. family history of skin cancer), environmental factors (e.g. high altitudes, UV-reflecting water, etc. ), and your perfect imperfections (e.g. moles, very fair skin, medication that may increase your sensitivity to sunlight, etc.) that can increase your risk to the damages of UV rays. Thus, if required, reapply more frequently and generously, invest in SPF50, avoid direct and peak-time exposure, etc. In summary, take any guidelines, recommendations, and advice, as just that, while adding your body, health, and environment into your sun protection equation. Avoid direct sun exposure between 10 a.m. & 4 p.m., hot day or not, as the UV light is at the peak of its intensity during the said time. While it may be easier said than done, but keeping your distance from sand, water, and even snow (especially within that time period), is encouraged, as they have sunlight-reflecting properties, further increasing your exposure to UV radiation. Accessorize. Befriend hats, sunglasses, and umbrellas. Since skin cancers commonly develop on the neck and ears, opt for hats with 2- to 3-inch brim, non-reflective underside, and tightly woven fabric (unfortunately, the stylish straw hats are not as effective). Similarly, to protect your eyes, as well as the skin around them, refer to labels, looking for the ideal 99-100% protection. Hide in shade and behind clothing. Think lengthy, dark-coloured, dry, and tightly-woven fabric to protect your skin. Similarly, and if available, opt for sun-protective clothing stating a UPF (UV Protective Factor) value, as they are tightly woven and absorb UV rays with a special coating. Paint your face. While makeup containing SPF may not be as UV ray-defensive as the real deal, think of them as an extra touch of sun protection to the already-delicate area. Since reapplication may be tricky, consider sprays and translucent powders with built-in SPF for touch ups. Like, yesterday. As somebody who understands the power of a bronzed and glow-y look, and has tanned on vacation and inside a tanning bed, I can definitely see the appeal. Yet, over the recent years I have assumed a more ‘preventative’ role in my skin’s health and began to understand how drastically the cons outweigh the pros. Similarly, with the abundance of products and services readily available, there is literally no reason for you not to try vitamin D supplements, organic spray tans, and at-home self-tanners. Lastly, I am asking you to join me on the UV ray-protection road to better skin and health, while only enduring the occasional “Oh, but you don’t even look tan” every time you go somewhere tropical. Haters gonna hate. Since we are talking skin health, what you do after being in the sun and layering, and re-layering, that SPF is just as crucial. Take it all off: Sweat, make up, multiple layers of sunscreen, dirt, and dust, have been sitting on that bod for hours, and if you listen carefully enough, I bet you can hear your pores’ agonizing gasps for air. Consider double-cleansing every day and exfoliating twice a week. Hydrate: This step is applicable before, during, and after sun exposure, as you consistently sweat and dehydrate your body, skin included, throughout the day. Double up on the water intake if patio sangrias and/or margaritas are involved. Mask+Moisturize: Focus on replenishing your skin’s moisture with hydrating masks (Click here for my list of hydrating masks, best sheet masks included), investing in a vitamin-rich night cream, and showing some extra love to the under-eye. Don’t forget about coconut oil and body butter for the rest of the beautiful you. That just about covers it. Hope you found this post helpful and informative (I definitely did, while doing my research) and continue to take even better care of your skin this summer. As always, please let me know if you have any questions, would like to add some suggestions on SPF-ing your skin, or want to simply say hello! Thank you to the American Academy of Dermatology, Canadian Skin Cancer Foundation, and American Cancer Society, for your continued effort to educate and raise awareness.